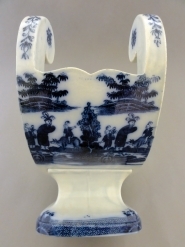 Robert Copeland's comprehensive review of this pattern on transfer-printed wares in Spode's Willow Pattern and Other Designs after the Chinese provides solid evidence that the Buffalo pattern was copied from an original Chinese export porcelain hand-painted design similar to the 8.9 inch Qianlong period plate (c. 1736-1795) shown here. This view shows the pattern printed in the interior of the piece. An image of the end of the piece printed in the Feathered Hats verion of the pattern. In this instance, the narrow, vertically oriented pattern was printed twice on each end. All the patterns are line-engraved. A rare earthenware cheese wheel, or cradle, printed in blue with two line-engraved versions of the Buffalo pattern. Spode's Type B is printed on the sides and in the interior. A second version of the Buffalo pattern, Feathered Hats, is printed on the ends of the piece. This example is not marked but, due to its shape and the characteristics of the patterns that match copper plates in the Spode Museum Trust archives, it can be attributed to Spode. Cheese wheels, sometimes referred to as cradles, were designed with their distinctive curved shape in order to hold an entire cheese round on its side, so that wedge-shaped pieces could be cut from it.